Bear Republic is right near wine country, so it was a good place to stop after the wineries had closed and we hadn't quite had enough. It took a little effort to find the place after parking in the large lot in the back. it's located on the strip of main street, but from the back didn't really have any signage that indicated it was the brewery. But, after a quick walk around the block we found our way there. We sat on the patio outside and ordered beer samplers (6 samples) and dinner. I don't remember much about the beers (it was a long day of drinking, after all), but there was a large selection. As for the meals, I was excited to see a prosciutto sandwich but was disappointed to find that the prosciutto was of fairly low quality, so that gets a "meh". Also, service was a bit infrequent, but I'll chalk that up to it being crowded and us being on the patio. 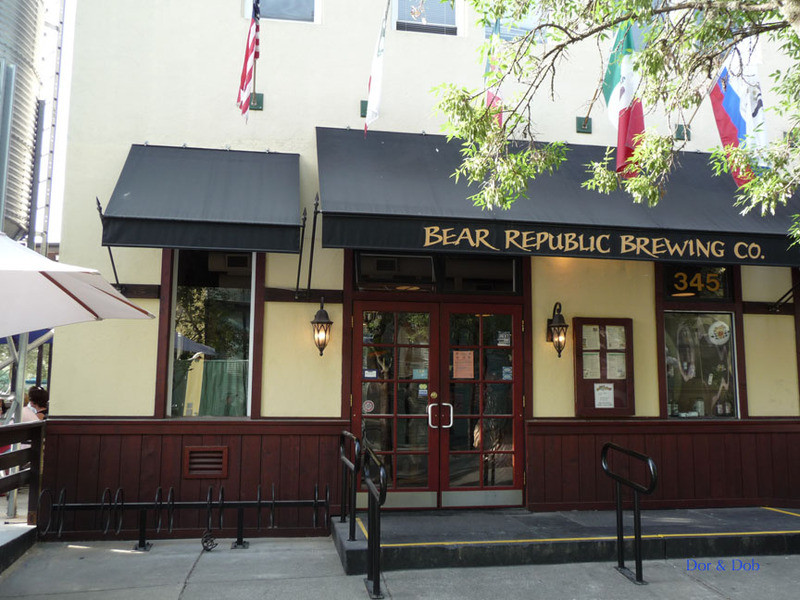 Bear Republic is a good sized place tucked behind the main street and occupying a corner that faces a wide pedestrian passage on one side and a row of trees screening a parking lot on the other. Itâ€™s got a good pub atmosphere and quite a good wine selection for a brewpub (though perhaps this is not so surprising given the location in the middle of wine country). The beer selection is impressive - 15 beers on tap on our visit: 4 regular ales, 4 limited-edition beers, 4 specialties, and 3 lagers. On the left from the entrance is the restaurant seating, lots of windows, and a great outdoor space. A few steps up on the right is a large bar area. The bar itself is fairly long, made of wood but with a copper top and flanked by tall chairs and a brass foot rail. The bar back has windows that look onto the brewery. There are also quite a few tables and chairs in this space. The bar area is separated from the dining area by the difference in elevation, a low wall, and a long padded bench. Floors are made of wood and the ceilings are high with exposed wooden rafters. 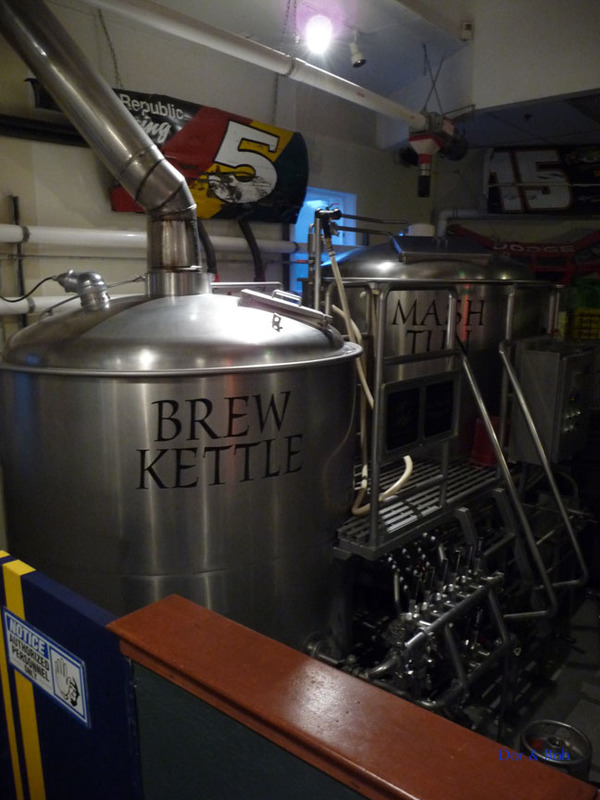 Decorations consist of a large model airplane, a hanging tandem bike, a painted mural at one end of the room, various bears, and several of the more usual beer-related items (flags, neon signs, etc.). Let me start off by saying that the bartender aka Ryan Lindecker of Bear Republic Brewing Co. was an exceptional bartender. I decided to bring my father to the brewery for his birthday since the Race 5 IPA has been his favorite IPA for many years. When we arrived at the brewery the staff actually let us in a few minutes early to enjoy their great beers. Ryan started us off with Grandma's Homegrown Ale which was very tasty with just the right balance of malts and hops. If you want to have a really enjoyable and educational time at a brewery, Bear Republic should be at the top of your list. The bar manager (Ryan) is full of brewing/beer/brewery knowledge. Just don't forget to ask him for his secret fishing hole. In regards to the food, I had the garlic fries. Wow, those fries were the best tasting garlic fries I have ever had. Back to the beer. 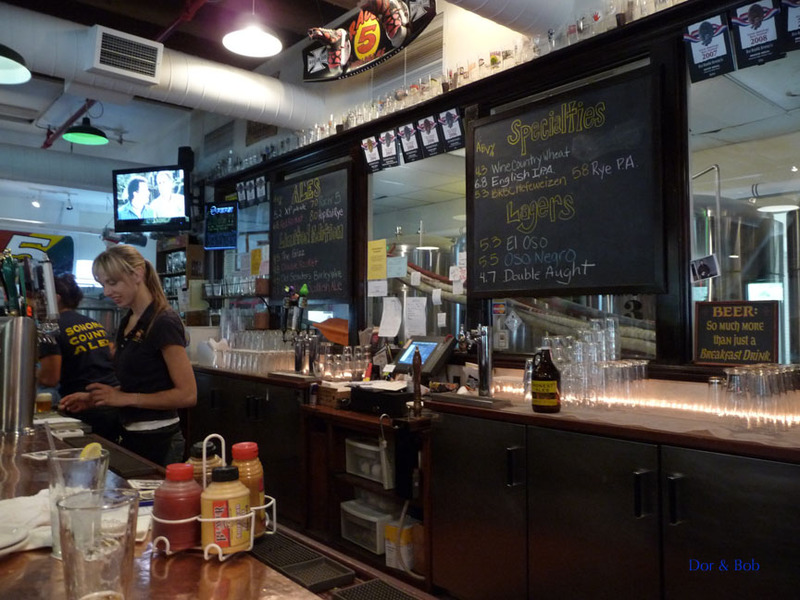 Exceptional beer selection, just make sure you try the Racer 5 IPA, Hop Rod Rye, Red Rocket Ale, and, well there all great. You might want to just get a hotel so you can try them all. Oh ya, ERIN ROCKS!!!! BR now usually has 10 or so on tap with more seasonals now being rotated in and out than in previous years. Noisy, big place where service can be a bit slow for food, but it is better than standard brew-pub food. Excellent beer and tons of well deserved awards. Seasonal treats to watch out for are Racer X, Heritage Ale, Homegrown, Late Harvest, hell, they're all good. Big back patio near the river is awesome on cool nights. How do I say this? I'm a local, and I LOVE the Hop Rod Rye, 3R, and Racer 5. The other beers (and they typically have about eight on draft) are probably OK, but I am fairly hop-centric in my choice of brews. So, I like the beers. The rest of the dining experience has been somewhat disappointing. In the food category, the menu is OK, but I wish that BR would refresh it periodically. I usually order the Black and Blue burger (blue cheese, Cajun spices, bacon, avocado, and a good-sized chunk of hamburger cooked to order - mot of the time. My alternate meal, if I'm not totally starving, is the french dip sandwich. It's decent - most of the time. The chili menu varies, and is frequently good (you can substitute a cup of chili, or ceasar salad for the fries that come with most sandwiches). What I have found is that both food quality and service have been spotty -- sometimes excellent, sometimes lacking. I must say that the last couple of visits have been just fine. Atmosphere is best described as spartan and loud. Although there is some flags hanging from the ceiling, some firefighter shirts on the walls, bycicles hanging here and there. the clutter doesn't provide a suitable foil for the OSB flooring that is found throught the place. 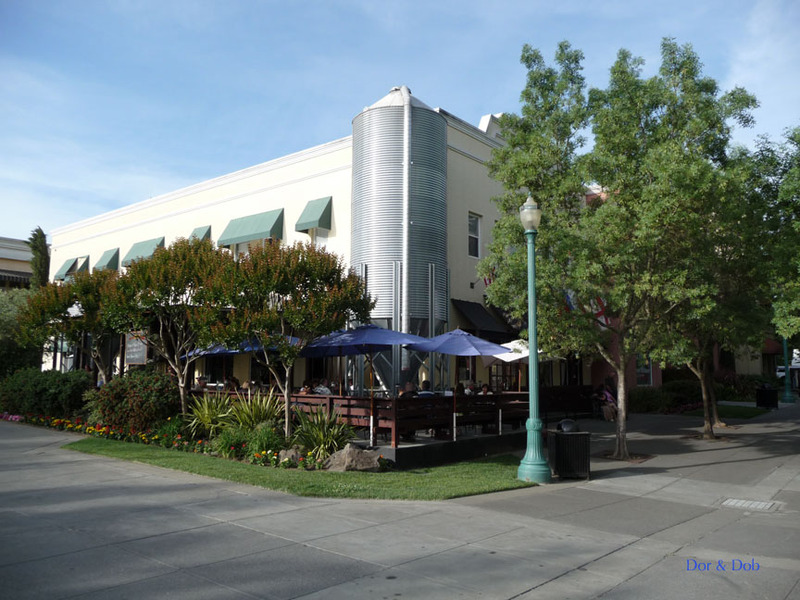 However, outdoor seating is ample, and wonderful in the summertime. Propane heat lamps extend the evening outdoor quaffing sessions. If weather (and seating) permits, as it does most of the time, opt for outdoor seating -- it's worth the wait. 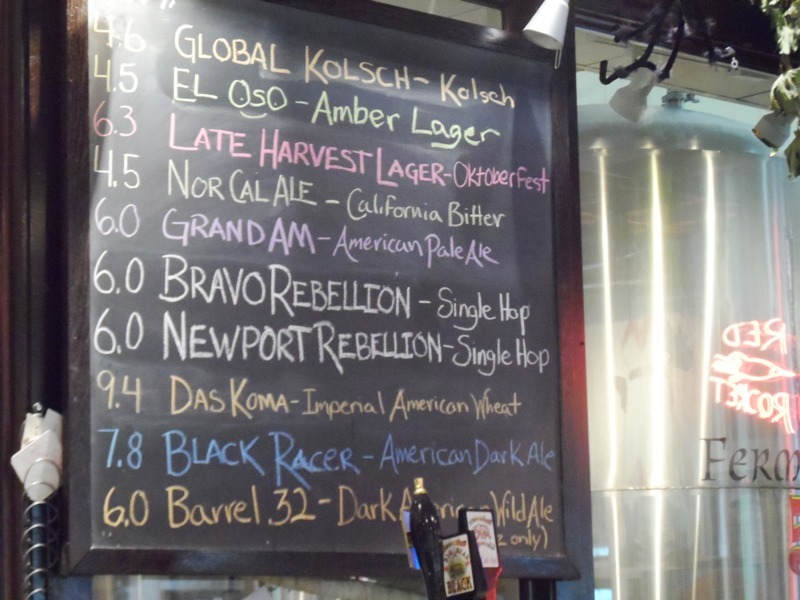 That said, my wife and I have frequently found it worthwhile to take a drive out of town to visit one of the other brew pubs either north or south of Healdsburg. Atmosphere, service, and food quality have been consistently better, and worth the trip. We've spent more time at brewpubs a short drive outside of town than going to BR during the past year. So, I must confess that I consider Bear Republic the "7-Eleven" of brew pubs - convenient, even if not at the top of my list. That said, I certainly order a Racer 5 if it is available at another eatery we happen to be at! Healdsburg is more known for wine but this place was still somehow slammed when I came in on a Sunday afternoon, although maybe it was the holiday (July 4th) weekend. I did a tasting tray, which was fairly expensive, and selected mostly darker beers. One great thing about Bear Republic is that they have a very wide variety of beers but manage to make each one of them good. Did I say good? I meant excellent! Healdsburg is one of those snotty, new wine country towns that have come on board to the fact that there are tons of stupid tourists willing to pay $5 for 1/3 glass of bad wine. The whole town is dedicated to these people, and this brewpub had an unfortunate number of them inside. 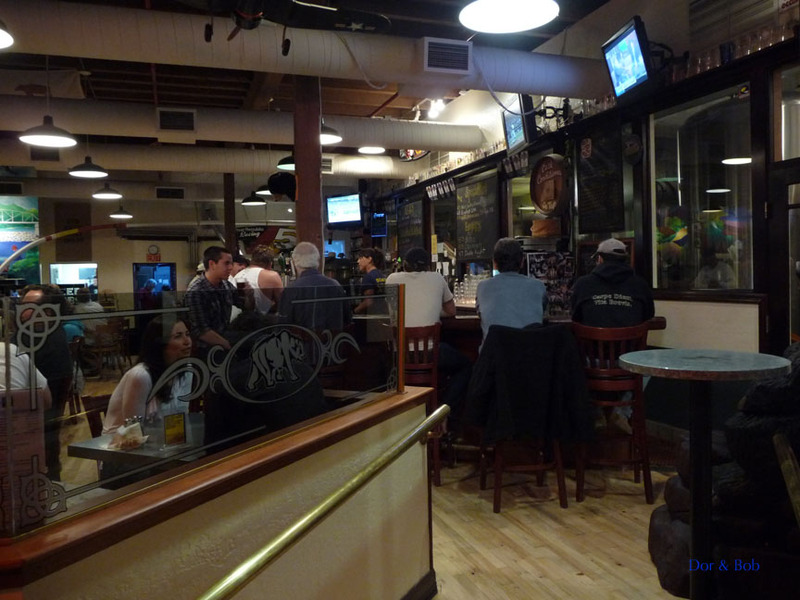 The atmosphere was way too sports bar for me, and a little more oriented toward the seating and food, although there were quite a few dedicated drinkers all along the bar and several people who came in from growler refills while I was there. Bartender was also a bit of a jerk, although I know tasting trays are a pain to do. I would only go back because they brew several beers that are not available in bottles. My absolute favorite was one of those, and it was disappointing not being able to leave with some of it.